As an additional cost to access a card in a remote server, the Runner must pay 1credit. Gagarin doesn't tax the runner if they don't run on remotes, so to take advantage of the ability, you want central servers that are dangerous or brutally taxing, and remotes that are just barely enticing enough to run on - that means not too much ICE, and assets that are just good enough to be worth running on and trashing. Because the runner always has to pay the tax if they want to access, Gagarin has a minor consolation against anti-asset cards like Whizzard: Master Gamer, Scrubber, and Imp. It can also be situationally useful against Film Critic or Faust decks that run on very lean economy. 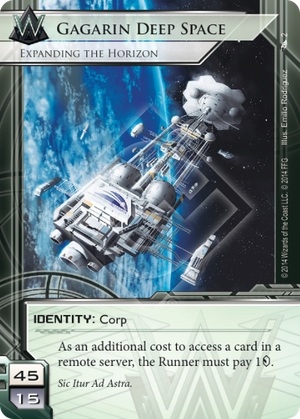 I believe this card would break the synergy of protecting Shell Corporation with a trap, as the runner can choose not to access the trap (when additional costs are factored in, the runner can elect not to pay them and not access, right? Like NAPD Contract or Fetal AI?). There aren't many other times where Weyland would play a trap, though, so my guess is that's not too much of a downside. Seems underpowered compared to the other IDs, but I think that this will improve over time... Taxing is always good. I'm not really sure that this is a "horizontal" ID, although you can play it that way... you can also make it as the "one more cost" to keep checking a scoring server, although that might only been 3-4 credits in a game in existing Weyland archetypes. Thats why I said this should get better in time - I don't see the archetype that gets more value from this ID then from the Building a Better World existing today, but I can see the design space for it (things like NAPD Contract and Midway Station Grid). How would this shape up if we had multiple upgrades and the Runner could not afford all of them? Can the runner access the first ones he chooses and not the rest, or does the runner have to go home empty handed?